Background and objectives: According to Chinese White Paper on Osteoporosis Prevention (2009), an estimated number of 69 million Chinese people are experiencing osteoporosis caused by loss and deterioration of bone mineral density (BMD). Middle-aged women have a greater possibility in developing osteoporosis in comparison with men because of a decreased estrogen level and degeneration in physical fitness level. A Tai Chi-based intervention in the present study will be created based on four components consisting of fall-prevention/balance training, stretching/flexibility training, resistance training (Tai Chi push hand), and strength training. Design: A prospective three-arm parallel randomized controlled trial. Methods: This study will take place in ten community centers in southeast China, and postmenopausal women aged 50–65 years and without menses for 6–12 months will be recruited and randomly assigned into three groups with the allocation ratio of 1:1:1 (n = 50 for each group), including two experimental groups (a traditional Tai Chi group and a modified Tai Chi-based intervention group) and a control group. Participants in the control group will be asked to maintain their original lifestyle during the 12-month intervention period. Participants in the traditional Tai Chi and modified Tai Chi-based intervention groups will experience the traditional Yang-style Tai Chi and receive the modified Tai Chi-based intervention, respectively. The modified Tai Chi-based intervention contains four components: 1) eight Tai Chi based fall-prevention movements; 2) ten Qigong-based stretching/flexibility movements; 3) eight resistance training-based Tai Chi push hand movements; 4) eight Chen style-based Tai Chi movements. For both the experimental groups, study participants will experience four 60-minute Tai Chi training sessions weekly for 12 months. Outcome measures: BMD at multiple musculoskeletal regions is primary outcome measure. Secondary outcome measures include low limb muscle strength, physical function, and reaction time at both upper and low limbs, which will be measured at baseline and 12 months (at the end of the intervention). Discussion: Results of this study will provide preliminary evidence regarding the value of Tai Chi movement as an intervention for attenuating BMD loss in postmenopausal women. Ethics and dissemination: This study protocol was approved by the Institution Review Board of Shanghai Sports University (approval No. 11290502800) and will be performed in accordance with the principles of the Declaration of Helsinki. Patient recruitment started in August 2017. The analysis of primary outcome measures will be completed in October 2018. The estimated study completion date is June 2019. Dissemination plans include presentations at scientific conferences and scientific publications. Trial registration: This trial was registered with the Chinese Clinical Trial Registry (registration No. ChiCTR-IOR-15005887) on 27 January 2015. There were a variety of long-term pharmacological therapies utilized for attenuating BMD loss or preventing osteoporosis in postmenopausal women, including levothyroxine, parathyroid hormone, raloxifene, oral alendronate, tamoxifen, and testosterone.,,, Aside from expensive drug therapies producing financial burden for their families, the positive results after the long-term drug therapies usage are not obvious with potential side effects. To gain better understanding regarding how to attenuate BMD loss or prevent osteoporosis in postmenopausal women, researchers conducted randomized controlled trials examining whether calcium supplementation, green tea polyphenols, dietary intervention, and other physical activity/exercise program (e.g., resistance training, jumping exercise, and walking) were effective in slowing down BMD loss.,,, Of these intervention programs, physical activity/exercise seems to be more cost-effective and easily manageable in long-run perspective. Tai Chi is a traditional health-promoting exercise that originated from mainland China, characterized by a graceful, mindful, slow, coordinated, and flowing movements along with shifting of body weight. As Tai Chi has become a popular physical activity, it attracts researchers worldwide and has been shown to have positive impact on physical, physiological, and psychological changes in healthy and clinical populations (e.g., Parkinson’s disease, cardiovascular diseases, breast cancer survivor, and mental illness).,,,,, In recent years, some researchers also attempted to determine whether Tai Chi has a protective effect in attenuating BMD loss in postmenopausal women.,, Based on a number of randomized controlled studies on this topic, researchers conducted a systematic review and gave a hint that a long-term (at least 24 weeks) Tai Chi-based intervention program containing resistance training-based component is required to obtain protective effect in attenuating BMD loss in postmenopausal women. Therefore, in this study a Tai Chi-based intervention will be created based on four components consisting of fall-prevention/balance training, stretching/flexibility training, resistance training (Tai Chi push hand), and strength training. Tai Chi push hand training is relatively equivalent to resistance training (moderate-to-high impact, weight-bearing) that may be effective in stimulating bone modeling and therefore attenuate BMD loss in postmenopausal women. A prospective three-arm parallel randomized controlled trial (RCT) will be conducted to evaluate the efficacy and safety of Tai Chi-based intervention in attenuating BMD loss in postmenopausal women. Each eligible participant will sign the consent form approved by Institutional Review Board of Shanghai Sports University (approval No. 11290502800) prior to intervention. The followings will be conducted sequentially in this study: (1) baseline assessment; (2) random allocation; (3) Tai Chi-based intervention; (4) post-intervention assessment. All outcome measures will take place in the sports science lab of Shanghai Sports University, China [Figure 1]. All study participants will be recruited from ten community centers in the southeast of China. People will be asked if they are willing to participate in this research project. All volunteers will go through a prescreening based on inclusion and exclusion criteria. Participants will be eligible if they: (1) are willing to participate in this research project regarding the effect of Tai Chi-based intervention on BMD; (2) are women aged between 50 and 65 years; (3) have been postmenopausal for 6–12 months; (4) are not involved in regular physical activity or other instructor-led exercise program before and during Tai Chi-based intervention period. Participants will be excluded if they: (1) are currently diagnosed with osteoporosis (osteoporotic fracture) or prior to this research project; (2) are regularly taking any medications or calcium supplementations that stimulates bone structure change and bone metabolism; (3) are diagnosed with the diseases (e.g., primary or secondary hyperthyroidism, skeletal metastases from cancer, multiple myeloma, pyogenic spondylitis) that limit physical function for participating in Tai Chi-based intervention program; (4) are currently practicing any other traditional Chinese Qigong exercises (e.g., Baduanjin, Wuqinxi, Daoyinshu, Tai Chi Chuan, Tai Chi fan, Tai Chi softball, and Tai Chi push hand) for more than 3 months. A questionnaire explaining osteoporosis and the purpose of the present study will be randomly sent to 1,200 people in ten community centers in the southeast of China. Those people who are interested in this research project will be invited to attend a free special lecture reporting knowledge of osteoporosis (e.g., osteoporosis as a major public health problem, who are at risk for osteoporosis, how to attenuate BMD loss for osteoporosis prevention, and the aim of the present study and procedures). Participants who are willing to participate will be asked to review and sign the written informed consent. Except for the primary and secondary outcome measures, the demographic information of the eligible participants will be collected during baseline, including age, weight, and height. Each eligible participant will be randomly assigned to three groups according to 1:1:1 equal proportion rule. The sequence of random allocation will be generated using an online random sequence generator by a graduate with no clinical involvement in this trial. The random code will be kept by an independent investigator not involving in the care or assessment of the participants, or in the data collection and analysis. In this trial, both the outcome assessors and the statistical analyst will be blinded to the randomization allocation and will not be involved in performance of the interventions. It will be, nevertheless, impossible to blind the participants and practitioners since they will perform the interventional protocols. Random parameters would be kept in the blind codes, using sealed opaque envelopes to conceal random allocation. Unblinding will only occur once all the outcome data collection is completed. The eligible participants will be randomly assigned into three groups with the allocation ratio of 1:1:1, including two experimental groups (traditional Tai Chi group and modified Tai Chi-based intervention group) and a control group. Participants in the control group will be asked to maintain their original lifestyle during 12-month intervention period. The present study includes two experimental groups because researchers want to determine whether modified Tai Chi-based intervention program is more effective in attenuating BMD loss in postmenopausal compared with traditional Yang-style Tai Chi, providing a guideline for preventing osteoporosis. Those participants who are assigned into the experimental group II modified Tai Chi-based intervention containing four components: (1) eight Tai Chi-based fall-prevention movements; (2) ten Qigong-based stretching/flexibility movements; (3) eight resistance training-based Tai Chi push hand movements; (4) eight Chen style-based Tai Chi movements. Resistance training-based Tai Chi movements are added in this group to determine whether the resistance training-based Tai Chi intervention is more effective than the traditional Yang-style Tai Chi forms. For both experimental groups, study participants experience four 60-minute Tai Chi training sessions weekly for 12 months. To ensure the relatively consistent instruction for Tai Chi sessions, all instructors consisting of Tai Chi champions will receive 2-week training, instructed by a sophisticated Health-Qigong master in China. BMD at multiple skeletal regions including lumbar levels L1, L2, L3, L4, L1–4, L2–4, and femoral neck, Ward’s triangle, femoral shaft, greater trochanter of the femur (primary outcome measure) will be measured by a dual-energy X-ray absorptiometry (DXA) instrument (DPX-L scanner; GE Lunar, Madison, WI, USA). A doctor who has an instruction experience of more than 10 years is responsible for measuring BMD. Secondary outcome measures include low limb muscle strength, physical function, and reaction time at both upper and low limbs, administered by three trained graduate students at the Human Performance Laboratory. After completing the baseline assessment, study participants are arranged at predetermined locations for 12-month Tai Chi training program (four 60-minute sessions weekly), respectively. All Tai Chi training sessions will take place at martial arts training center of Shanghai Sports University. Researchers will use Dual-Energy X ray absorptiometry (DXA) because it has been recognized as a reliable assessment tool for measuring BMD at skeletal regions such as femoral neck. A specialist is blinded to the purpose of the present study who is responsible for measuring BMD for obtaining precise data. A quadriceps device will be used to measure low-limb muscle strength. Each participant will be asked to sit on the exam table and hang over the edge of the table while bending at 90 degrees; the foot is placed within a dynamometer; both hands hold handles on two sides of the exam table with keeping their back straight. When the participant is ready, he or she is asked to extend his or her knee to ensure a maximum strength can be measured (kg, weight is recorded to the nearest 0.1 kg). There are three trials for each leg and a mean value will be used for data analysis. Star Excursion Balance Test (SEBT) will be used to measure physical balance. Prior to this test, a star pattern in eight directions (anterior, posterior, medial, lateral, posterolateral, posteromedial, anterolateral, and anteromedial) is created based on 45 degrees between each two directional lines. Each participant will be asked to place his or her one foot in the middle of the start pattern. When the participant is ready, he or she is instructed to reach his or her another foot as far as possible for the eight directions according to clockwise principle. There are three trials for each participant and a mean value is used for data analysis. Study participants who are able to complete 12-month intervention program will be compensated with money and souvenir. If these pragmatic conditions (e.g., job relocation, schedule conflict, or lacking motivation) are present, they are allowed to withdraw from the present study at any time. In addition, a predesigned worksheet is given to each participant to record his/her adverse events during the 12-month intervention period. When fall-related fracture, musculoskeletal injuries, or hospitalization required occurs, the participants will be immediately notified to see a doctor. Muscle-related soreness, pain, or discomfort is present 3 days after Tai Chi session will not be considered as the adverse events. Based on the results of a previous study by Yamazaki et al., we assume a between-group difference in the change in BMD is 0.5%. Since an overall dropout rate of 20% was anticipated, the required sample size will be 150 (75 patients per group) with a false-positive error of 5% and power of 80%. Statistical analyses will be performed using SPSS 20.0 software. Normal distribution will be examined with Shapiro-Wilk Test. Paired Student’s t-test will be used to compare the intra-group differences in primary and secondary outcomes between baseline and 12-month follow-up. Inter-group difference in all outcome measures will be compared with analysis of variance. In particular, to detect whether 12-month Tai Chi-based training is effective in attenuating BMD loss, percentage change will be calculated by BMD at baseline minus BMD at 12-month follow-up dividing by BMD at baseline. An independent data monitoring committee (DMC) consisting of seven experts (two medical doctors, two physicians, two ethicists, and a statistician) will periodically review and assess available study data for safety, conduct and efficacy. Based on predetermined date, the DMC will meet and discuss the study results. The termination of the study project can be recommended by the DMC if serious adverse events, overwhelming benefits (participants in the experimental group is shown to be undoubtedly superior to those in the control group), and futility (when approximately half of all the expected events have been recorded) are monitored. Tai Chi-based intervention as a moderate intensity exercise will be administered by several experienced Qigong instructors and monitored by medical doctors from Shanghai Renji Hospital, which ensure the safety of all study participants. In case the study participants experienced any body damages, they will be suggested to withdraw from this study. Any muscle-related soreness following the Tai Chi-based training sessions will not be considered harms. Two physicians from Shanghai Renji Hospital will be responsible for auditing the entire process of the study project, particularly data collection and analysis. This research project was approved by Institutional Review Board of Shanghai Sports University (approval No. 11290502800). Each participant will sign a consent form approved by Institution Review Board of Shanghai Sports University before intervention. All data will be accessible two months after the publication of study results. Trial status: Patient recruitment started in August 2017. The analysis of primary outcome measures will be completed in October 2018. The estimated study completion date is June 2019. Pilot results are shown in [Table 1]. Postmenopausal osteoporosis is a prominent public health problem. The purpose of this study is to assess the efficacy and safety of 12-month Tai Chi-based intervention in attenuating BMD in postmenopausal women. To our knowledge, this is the first prospective randomized controlled study to provide the long-term follow-up results of changes in BMD in multiple musculoskeletal regions of postmenopausal women receiving modified Tai Chi-based intervention containing fall-prevention/balance training, stretching/flexibility training, resistance training (Tai Chi push hand), and strength training. 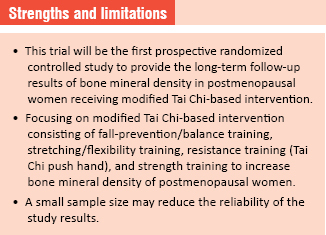 We hope this RCT will provide scientific evidence to an effective intervention for attenuating BMD loss in postmenopausal women regarding modified Tai Chi-based intervention in managing bone mineral loss. Editorial Board of Osteoporosis Prevention and Treatment (China White Paper) CHPF. White paper on osteoporosis. Zhonghua Jiankang Guanlixue Zazhi. 2009;3:148-154. Looker AC, Melton LJ 3rd, Harris TB, Borrud LG, Shepherd JA. Prevalence and trends in low femur bone density among older US adults: NHANES 2005-2006 compared with NHANES III. J Bone Miner Res. 2010;25:64-71. Greendale GA, Barrett-Connor E, Ingles S, Haile R. Late physical and functional effects of osteoporotic fracture in women: the Rancho Bernardo Study. J Am Geriatr Soc. 1995;43:955-961. Melton LJ 3rd. Adverse outcomes of osteoporotic fractures in the general population. J Bone Miner Res. 2003;18:1139-1141. Behre HM, Kliesch S, Leifke E, Link TM, Nieschlag E. Long-term effect of testosterone therapy on bone mineral density in hypogonadal men. J Clin Endocrinol Metab. 1997;82:2386-2390. Delmas PD, Bjarnason NH, Mitlak BH, et al. Effects of raloxifene on bone mineral density, serum cholesterol concentrations, and uterine endometrium in postmenopausal women. N Engl J Med. 1997;337:1641-1647. Liberman UA, Weiss SR, Bröll J, et al. Effect of oral alendronate on bone mineral density and the incidence of fractures in postmenopausal osteoporosis. N Engl J Med. 1995;333:1437-1444. Neer RM, Arnaud CD, Zanchetta JR, et al. Effect of parathyroid hormone (1-34) on fractures and bone mineral density in postmenopausal women with osteoporosis. N Engl J Med. 2001;344:1434-1441. Wayne PM, Kiel DP, Buring JE, et al. Impact of Tai Chi exercise on multiple fracture-related risk factors in post-menopausal osteopenic women: a pilot pragmatic, randomized trial. BMC Complement Altern Med. 2012;12:7. Dawson-Hughes B, Dallal GE, Krall EA, Sadowski L, Sahyoun N, Tannenbaum S. A controlled trial of the effect of calcium supplementation on bone density in postmenopausal women. N Engl J Med. 1990;323:878-883. Hui SS, Xie YJ, Woo J, Kwok TC. Effects of Tai Chi and walking exercises on weight loss, metabolic syndrome parameters, and bone mineral density: a cluster randomized controlled trial. Evid Based Complement Alternat Med. 2015;2015:976123. Shen CL, Chyu MC, Pence BC, et al. Green tea polyphenols supplementation and Tai Chi exercise for postmenopausal osteopenic women: safety and quality of life report. BMC Complement Altern Med. 2010;10:76. Shen CL, Williams JS, Chyu MC, et al. Comparison of the effects of Tai Chi and resistance training on bone metabolism in the elderly: a feasibility study. Am J Chin Med. 2007;35:369-381. Ding L, Chen B, Zou L, Tian Z. An investigation of motivational differences for participants in Chinese martial arts. Asia Pac J Sport Soc Sci. 2015;4:53-66. Chou KL, Lee PW, Yu E, et al. Effect of Tai Chi on depressive symptoms amongst Chinese older patients with depressive disorders: a randomized clinical trial. Int J Geriatr Psychiatry. 2004;19:1105-1107. Lee MS, Pittler MH, Taylor-Piliae RE, Ernst E. Tai chi for cardiovascular disease and its risk factors: a systematic review. J Hypertens. 2007;25:1974-1975. 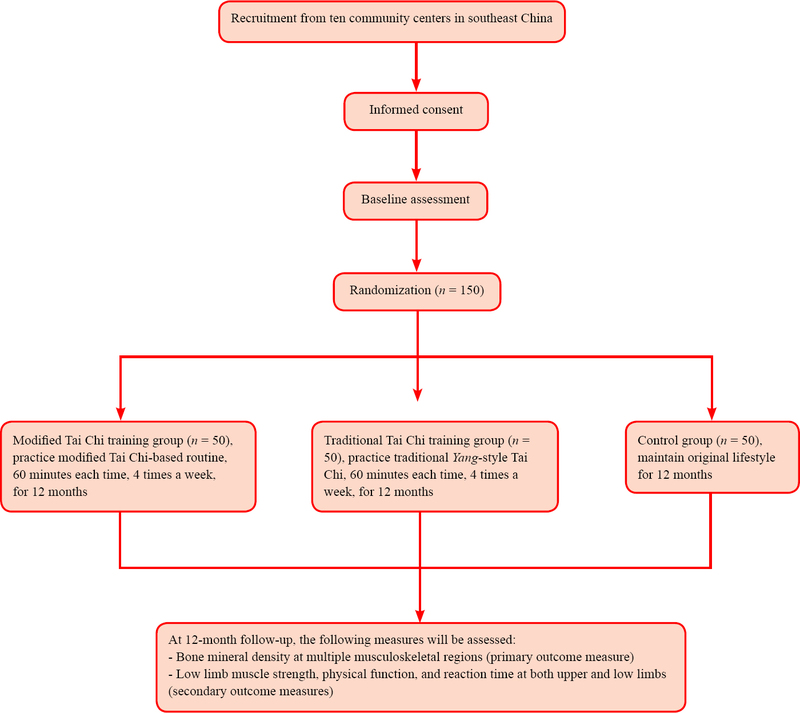 Mustian KM, Katula JA, Gill DL, Roscoe JA, Lang D, Murphy K. Tai Chi Chuan, health-related quality of life and self-esteem: a randomized trial with breast cancer survivors. Support Care Cancer. 2004;12:871-876. Lou L, Zou L, Fang Q, et al. Effect of Taichi softball on function-related outcomes in older adults: a randomized control trial. Evid Based Complement Alternat Med. 2017;2017:4585424. Wang H, Wei A, Lu Y, et al. Simplified tai chi program training versus traditional tai chi on the functional movement screening in older adults. Evid Based Complement Alternat Med. 2016;2016:5867810. Zou L, Wang H, Xiao Z, et al. Tai chi for health benefits in patients with multiple sclerosis: A systematic review. PLoS One. 2017;12:e0170212. Chan K, Qin L, Lau M, et al. A randomized, prospective study of the effects of Tai Chi Chun exercise on bone mineral density in postmenopausal women. Arch Phys Med Rehabil. 2004;85:717-722. Song QH, Zhang QH, Xu RM, et al. Effect of Tai-chi exercise on lower limb muscle strength, bone mineral density and balance function of elderly women. Int J Clin Exp Med. 2014;7:1569-1576. Wayne PM, Kiel DP, Krebs DE, et al. The effects of Tai Chi on bone mineral density in postmenopausal women: a systematic review. Arch Phys Med Rehabil. 2007;88:673-680. Sievänen H, Oja P, Vuori I. Precision of dual-energy x-ray absorptiometry in determining bone mineral density and content of various skeletal sites. J Nucl Med. 1992;33:1137-1142. Gribble PA, Hertel J, Plisky P. Using the Star Excursion Balance Test to assess dynamic postural-control deficits and outcomes in lower extremity injury: a literature and systematic review. J Athl Train. 2012;47:339-357. Yamazaki S, Ichimura S, Iwamoto J, Takeda T, Toyama Y. Effect of walking exercise on bone metabolism in postmenopausal women with osteopenia/osteoporosis. J Bone Miner Metab. 2004;22:500-508. LYZ and HRW designed the trial protocol. LYZ and CYW wrote the manuscript. All authors approved the final version of the manuscript. This study protocol was approved by the Institution Review Board of Shanghai Sports University (approval No. 11290502800) and will be performed in accordance with the Declaration of Helsinki. Written and signed informed consent will be obtained from all participants prior to inclusion in the study. This trial was registered in the Chinese Clinical Trial Registry (registration No. ChiCTR-IOR-15005887). The authors certify that they will obtain all appropriate participant consent forms. In the form, participants will give their consent for their images and other clinical information to be reported in the journal. Participants understand that their names and initials will not be published and due efforts will be made to conceal their identity, but anonymity cannot be guaranteed.